Regan Cotter | NZACE | New Zealand Association for Cooperative Education Inc.
Regan is a marketing and management lecturer for the EIT School of Business and manages their Work Integrated Learning course. He comes with a varied and extensive background in sports coaching, teaching, and business with a particular focus on sales and marketing. 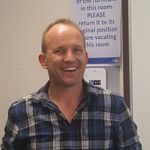 He is very passionate about developing vocational pathways for his students and is currently completing his masters with a strong focus on work integrated learning.